Fifteen people were injured after two people detonated an improvised explosive device at an Indian restaurant in Canada late Thursday night, authorities said. NBC 5's Lauren Petty reports. Fifteen people were injured after two people detonated an improvised explosive device at an Indian restaurant in Canada late Thursday night, authorities said, as they hunted for the suspects. 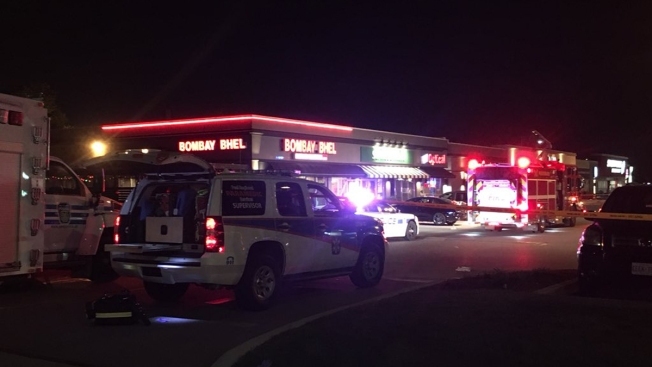 Police in Mississauga, Ontario, received a call reporting an explosion at Bombay Bhel restaurant at 10:30 p.m., Toronto Police Constable Iryna Yashnyk said. Three people with serious "blast type" injuries were taken to a Toronto trauma center, according to Peel Regional Police. They are in stable condition. Twelve more people have minor injuries. "We have no indication to call it a hate crime or any kind of terrorism act," Peel Region Sergeant Matt Bertram said. The call came in 30 minutes after the restaurant closed, according to NBC News. Police said patrons are among those injured. Bertram said police yet cannot say what the device is, adding, "different callers called in and said it was firecrackers or some said gunshot sort of noises. I don't think it was an explosion that was rocking anything." He said police won't be able to tell what the device was until they can analyze the material. Both suspects are males, police tweeted. One is described as being in his mid-20s and about 6 feet tall, with a stocky build. He was wearing a dark zip-up hoodie with the hood on over a baseball cap with a light grey peak, and his face was covered with black cloth. The second suspect is described as being about 5' 10" with faded blue jeans, a grey T-shirt and dark skate shoes. He also had a dark zip-up hoodie pulled over his head and his face covered. Police expect the plaza where the restaurant is located to be sealed off for the rest of the night, and are seeking the public's help in identifying the suspects who set off the explosives. The Indian consulate in Toronto tweeted that it opened a helpline for people seeking assistance following the explosion. The Consulate General of India in Toronto has opened a helpline in view of the explosion at an Indian restaurant in Mississauga. For any assistance, pl call +1-647-668-4108. Yashnyk said there are no details available yet on how many people were in the restaurant when the incident took place or what where in the restaurant the blast happened. It is unclear whether any of the injured are employees. Andre Larrivee, who lives in a nearby condo, said he was watching television and heard a loud explosion. "It was really loud," he told The Associated Press, comparing the noise to an electric generator that had recently exploded at a nearby construction site. Vikas Swarup, India's High Commissioner to Canada, tweeted that India's Consul General in Toronto visited the injured in the hospital. Additionally, he said the three Indian-Canadians who were reported to be critically injured are stable.